Mike is a driven passionate leader for stand up paddle boarding. He started Urban Kai with his wife, Aimee, from the ground up. 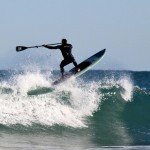 By day, he’s a stand up paddling expert with emphasis on form and the fitness benefits that he carries into his athletic training background to broaden his client’s skills while having a good time. By night, he runs the company, making sure to always find the best products for stand up paddling while incorporating fitness benefits and he organizes client’s routines so everyone has fun along with experiencing a challenging innovative workout. 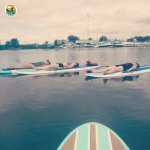 His experience runs the gamut from training professional tennis and volleyball players to teaching young children and seniors the benefits of stand up paddling for their overall fitness. He has over 100 clients who have either increased their personal athletic goals with his training assistance and/ or lost weight to become healthier physically fit individuals who happily credit Mike with their success. Mike has a background in Athletic Training he is N.A.S.M., Premier, A.C.E. Paddle Fit, CPR/AED & Wilderness First Aid Certified and has an extensive knowledge of the land and water having spent much of his life in Florida. He also has an extensive surfing & ocean background having spent his teen and college years in the state of California where he paddled on Santa Barbara Outrigger Canoe Club and spent much of his time in the surf. 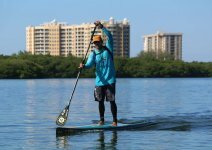 You can find Mike at Urban Kai SUP Shop located at 13090 Gandy Blvd, St. Petersburg FL 33702 and, of course, out on the water! 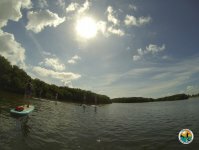 During the summer of 2009 Aida was introduced to the sport of Stand Up Paddle boarding. Now an avid paddler, Aida enjoys introducing the sport to new paddlers and loves to watch the stoke people get when they try it for the first time. 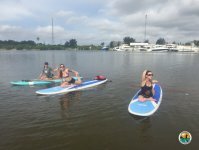 Aida likes to teach paddlers that fitness is really fun! On her days off you can find Aida doing a distance paddle or surfing if there are waves. Aida is CPR/AED & First Aid Certified. You can find Aida at Urban Kai SUP Shop located at 13090 Gandy Blvd, St. Petersburg FL 33702 or at the beach with her husband and 2 kids! Kerry is a 200-hour registered yoga teacher (RYT-200) certified in Hatha Vinyasa and Ayurveda Therapy through the Yoga Alliance.